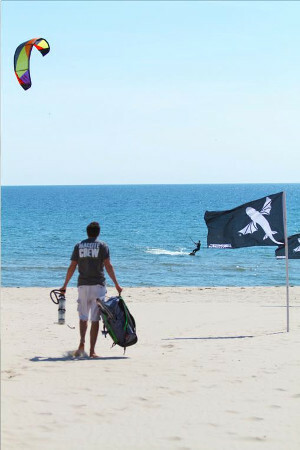 Fly A Trainer Kite & Learn the Basics of Kiteboarding! You may have seen kiteboarding on TV or while visiting one of Michigan's great beaches, watching in amazement and wondering if you could partake in this amazing sport. Well, here is your chance to learn the basics of kiteboarding safely and have the chance to ask all those questions you have running around in your head. Am I strong enough? Do I weigh too much? Where can I ride? How much does it cost to start? All these questions will be answered. MACkite's Ground School is our starter class designed to get you started in the adrenaline-pumping sport of kiteboarding by safely learning the fundamental concepts and techniques of power kite flying. Ground School is the fist step of your journey to boosting huge air, tearing up killer Lake Michigan waves, and competing with your friends for bragging rights for who can huck the biggest new trick of the season! This on-land class covers rigging, line management, flying techniques, kiteboarding safety, rider responsibility, and trainer kite flying. Along with flying power foil trainer kites ranging in size from 1.8 sq meters to 5 sq meters, you will learn how to rig a full-size kiteboarding kite and will become familiar with the different pieces of kiteboarding equipment. By participating in this class and continuing the use of a trainer on your own time, you will progress much further during your 2 Day Kiteboarding Camp. With these kite flying skills under your belt, your instructor will able to move you to a full-sized kiteboarding kite much sooner. During this 1.5 hour class, you will learn the basics of trainer flying and how to progress into the exciting sport of kiteboarding. We provide all the trainer kites needed for the class. Items to bring may include sunscreen, water, and weather appropriate clothing. If you already own a trainer and would like to bring it, you are more than welcome. Ages 10 and up. Groups may range from 2-8. By appointment only. Please call 800-622-4655 to set up a Ground School Lesson. MACkite has been offering lessons for over 14 seasons and we’re pumped for another season of teaching students the life-changing sport of kiteboarding! We offer all of our summer lessons at the MACshack at 1801 Beach St in Muskegon, which is reserved specifically for our students. Our instructors teach hundreds of students every year on how to ride safely and to learn the undying love of kiteboarding. We hook up our students with the latest gear - after all, we are in the business of making kiteboarders! In the fall, winter, and spring, students will enjoy their lessons in our indoor teaching area at our Board Sports Center at 16881 Hayes St in Grand Haven. During those cold sessions, we will instruct you the basics while you remain toasty in our shop, then we’ll throw you outside to practice what you’ve learned. Whether you’re kiteboarding or snowkiting, MACkite will follow you through the entire process. Why? It’s our job, of course! We love getting people stoked about kiteboarding.